The value of a more effective meeting culture has long been known, but it is only this year that the industry is seeing a long-awaited change to make meetings better and more productive. 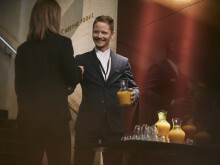 Through certified meeting advisors, technical solutions, creative exercises and healthy food, Scandic’s new meeting concept aims to change the way 10,000 customers plan and conduct meetings. Employees today spend about 30 percent of their working time in meetings. * Creating a positive and effective meeting culture is consequently becoming increasingly business-critical for companies. This is why Scandic is now investing significantly in its meetings offering in the Nordic countries and Europe.